One of the first things you notice at Crossroads Dining Hall is that there are no trash cans. If you don’t eat what’s on your plate, you recycle it. UC Berkeley is doing such a good job of recycling that today (Thursday, Nov. 15), America Recycles Day, the regional administrator of the Environmental Protection Agency came to campus to praise Cal Dining’s efforts to reduce the food waste stream — in particular, by cutting upstream food purchases to limit downstream waste. 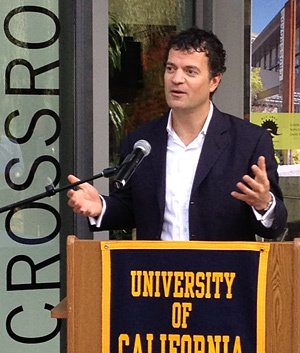 EPA regional administrator Jared Blumenfeld, a 1992 graduate of Boalt Hall Law School, addressed a crowd in front of Crossroads Dining Hall to recognize UC Berkeley for its efforts to reduce food waste on America Recycles Day. Photo by Margaret Ford/EPA. Shawn LaPean, executive director of Cal Dining, said that employees recycle as much uneaten food as possible: leftovers are often picked up by student groups to take to homeless shelters, while trimmings, scraps and post-consumer waste are diverted to composting. Since August 2011, Cal Dining staff have also weighed and tracked wasted food via computer software called LeanPath. Thanks to the software and staff incentives, Cal Dining has reduced kitchen waste by over a third – from more than 3,000 pounds a week to about 2,000 –resulting in avoided food purchases of more than $1,600 each week. Cal Dining’s goal for 2013-14 is to have food cost savings of approximately $700,000. So it’s no surprise that Cal Dining was one of the first to sign up this year when the EPA initiated its Food Recovery Challenge. To date, nearly 60 colleges and universities nationwide – including eight UC campuses – have pledged to reduce their food waste by 5 percent in one year. “If each of these colleges representing 460,000 students saves 5 percent of food waste going to landfills, that amounts to about 3 million pounds of food,” Blumenfeld said. UC Berkeley’s food waste reduction and recycling program is part of a campuswide effort to make UC Berkeley sustainable and to lower its carbon footprint in the face of global climate change. 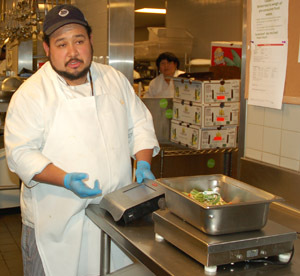 Sous chef Hector Arena shows how kitchen staff at Crossroads Dining Hall measure waste – trimmings, spoiled or unused food – in order to track and reduce waste, saving as much as $1,600 per week in food costs. Jean Smith photo. In the Crossroads Dining Hall, students deposit their trays ‑ uneaten food, utensils, napkins and all – for staff to sort into separate piles: compostable, reusable or recyclable. Dishes are washed, but the compostables are squeezed dry and sent to a local composting firm in Richmond, saving energy and greenhouse gas emissions formerly required to truck the waste to the Central Valley, said campus recycling coordinator Lin King. By promoting reusable, recyclable or compostable cups, utensils and trays, plus the newest initiative – giving students a choice between reusable and compostable take-out boxes – Cal Dining plans to reduce landfill waste to zero by the year 2020. Greenhouse gas emissions have dropped by 3.7% relative to 2010, primarily because our utility provided additional low-carbon power. While total GHG emissions have risen 11.7% since 1990, emissions per research dollar have dropped by 31.5% in that same time period. Water use dropped 3.6% last year and is down 8.2% since 2008 – close to our 2020 reduction goal of 10%. Campus sales of water bottles have declined by 48% since 2006. The campus has 10 LEED™ certified building projects, representing almost 7% of total square footage. The waste diversion rate for campus (when construction waste is excluded) has increased by 5 percentage points to 46%, while the amount of solid waste sent to landfills by the campus went down by 4.4% last year. Fuel use from fleet and commute continues to be at least 25% below 1990 levels, exceeding the campus goal. The percentage of green vehicles in the fleet has risen to almost 22%. Campus purchases of sustainable foodremain higher than the 20% goal set for 2020.